It’s the 12th week of the year. In numerology, that adds up to 1+2=3. 3 is a number of creativity, nurturing and freedom. This is an interesting number for the week because the Spring Equinox falls between Saturday, 3/19/16 and Sunday 3/20/16 in the Northern Hemisphere. The card for the week is the 7 of Cups, which is a card of dreams and fantasies. Know that thoughts are the seeds of future realities and with the right amount of dedication, you can manifest what is planted in your mind. We also have a partial lunar eclipse this week on 3/23/16. This eclipse will be visible throughout most of Asia, North America, Australia and South America. This eclipse rides in on the back of the full solar eclipse on 3/18/16. Many people felt a big shift in their power during this interim period. It was a time to shift your destiny and through focusing your will on all that you desire. This eclipse will bring a cooling down of the intensity from the solar eclipse but the transits will bring additional shifting energy but I’ll safe those details for Wednesday’s forecast. It’s going to be an interesting week. Mantra: The seeds of our dreams can blossom into reality. The card of the day is the King of Swords. When the King appears, truth will be revealed and clarity obtained. The King is also ruled by air, the element of Spring. The Moon is void of course until 10:39 AM PST so use the morning to let revelations come to you. Venus conjunct Neptune at 10:46 AM will bring the potential to connect with others on a soul love level. Be selfless in love and don’t hold others to high expectations because how one expresses love is on their own freewill. Moon square Mars at 8:13 PM PST could bring out the darker side of the King of Swords, which is violent, pugnacious and even abusive. If confrontations arise, handle them as constructively as possible. The Moon is in the detail oriented sign of Virgo for most of the day, so like the light side of the King of Swords, let your battles be battles of the intellect. The number of the day is 5, a number of overcoming hardships. Mantra: My mind is the sharpest weapon I have. 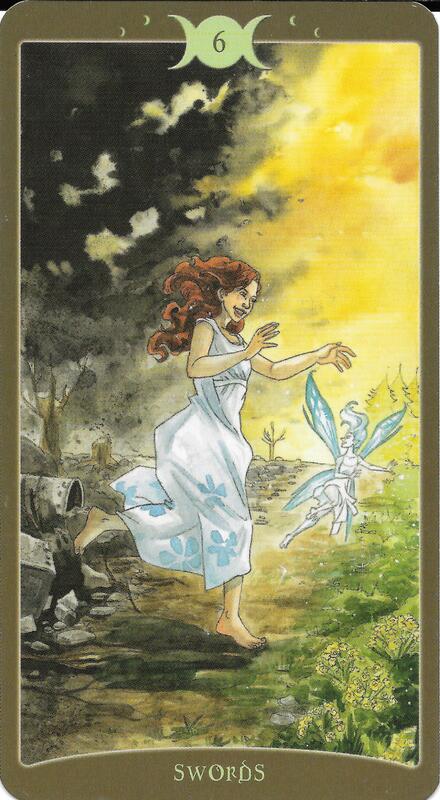 The Six of Swords is a card of moving on to bigger and better things. The events of today will show you what’s been holding you back and give you the strength to move on from that. Moon opposition Neptune at 7:00 AM PST will bring fantasies and illusions along with heightened sensitivity. Moon opposition Venus could bring out the best or worst in relationships but the effects will be intense. Mercury enters Aries at 5:19 PM PST where he will stay until 4/5/16. When Mercury is in Aries, our thinking is direct and communication is direct and to the point. We charge ahead into new beginnings as we take on leadership roles to work for what we believe in. Moon square Saturn at 7:07 PM PST can bring depression. Moon conjunct Jupiter at 7:27 PM PST will help you bounce back with optimism. Moon trine Pluto at 8:54 PM PST will find intense emotions igniting into passion. The Moon is in Virgo until 8:54 PM PST so pay attention to details. Six appears twice today, both as the number for the day and the card of the day so expect breakthroughs that will lead to victories. The card of the day is the Capricorn Queen of Pentacles. She is practical and grounded. This allows her surround herself with abundance.The Moon is void of course for most of the day so it’s a time to embrace stability by wrapping up projects and sticking to routine. You may find yourself putting things in perspective and coming to appreciate the more mundane things life. The number of the day is 7, reminding us that if you feel stuck or board with life, sometimes what you really need to move forward is to embrace what we have instead of looking to new horizons. We have a lunar eclipse in Libra at 5:01 PST. This eclipse will be visible in Asia, Australia, North America and most of South America. Lunar eclipses are all about rearranging relationships. Libra is all about trying to achieve balance in relationships. But the aspects affecting this eclipse, just like the last eclipse, are all about power and forcefulness. Once again, I’ve omitted times for minor transits to cut to the chase. Jupiter square Saturn will bring confusion to relationships. You may not know what direction to take, especially if you’ve been manipulated by someone close to you or on a more international scale, political leaders or wannabe political leaders. Moon opposition Mercury may cause you to be judgmental due to things that you don’t understand. There may be hate speech or hate acts against minorities, women, and the LGBT community. People who are marginalized may have trouble finding a voice. This rides on the back of the deceit and underhandedness that came with the solar eclipse at the beginning of the month. 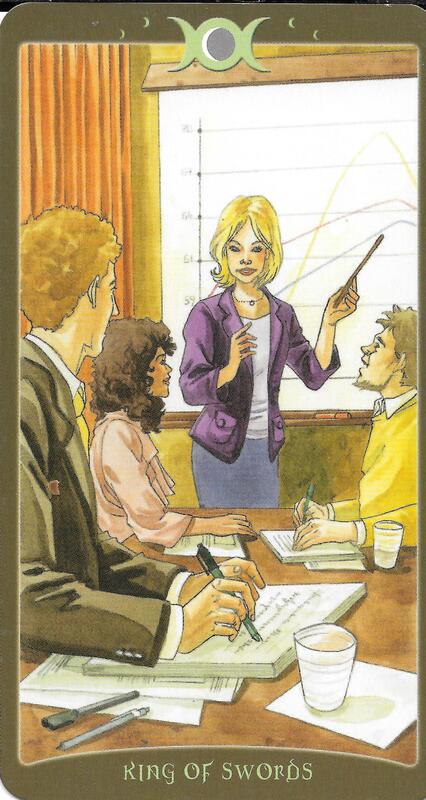 Moon sextile Mars will allow those who speak passionately to gain more influence. Sun conjunct Mercury will have everyone talking about what’s going on. Those who are self-involved will monologue and others will listen. This is a time to think logically and take everything in. After this eclipse, however, we’ll see a cool down and we’ll have time to process all that we learned during this eclipse season. Hopefully, you’ll have gotten the most out of these energies and walked away empowered and ready to take on the world. The Moon is in Libra and the number of the day is 8, reminding us that everything we experience we bring upon ourselves in one way or another. Mantra: We hold the answers for the challenges we create for ourselves. 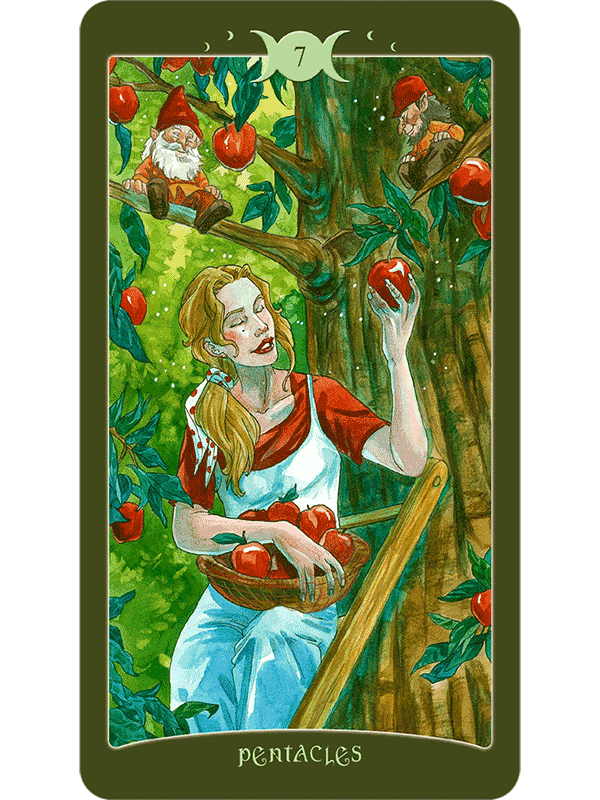 The card of the day is the Seven of Pentacles, a card of reaping the rewards of our hard labors. Moon sextile Saturn at 7:33 AM PSt brings a level head to your morning. Moon square Pluto at 9:26 AM PST will leave you searching for deeper answers in life. Be ready to accept revelations. Moon opposition Uranus at 1:55 PM PST may find you taking drastic actions based on the revelations earlier in the day. Think all actions through carefully before you act because Mercury trine Mars at 3:45 PM PST will bring the confidence and mental dexterity you need to solve any problems that arise. The number of the day is 9, a number of endings becoming beginnings. The Moon until 1:55 PM PST, reminding you to stay balanced in the face of challenges. Mantra: I’ve worked hard for and deserve everything I have. 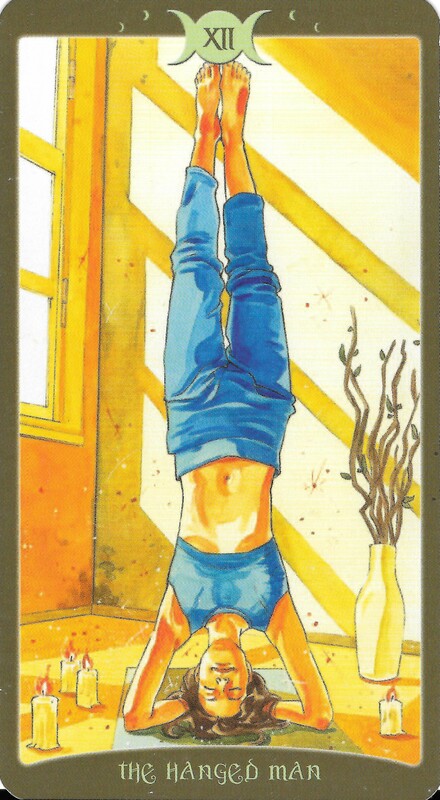 The card of the day is the Hanged Man, indicating a time of being hung in suspense, so to speak. We may also be called to sacrifice part of ourselves to learn a greater lesson. This is fitting because Saturn stations retrograde in Sagittarius at 3:01 AM PST and will be in retrograde until August 13. While Saturn is retrograde in Sagittarius, you may have trouble setting boundaries with others. Karmic contracts have the potential to be fulfilled through learning about discipline. Venus opposite Jupiter at 4:58 AM PST brings indulgence and enjoyment of everything that gives you pleasure. Enjoy it and savor it but make sure not to go overboard. This is also a good time forge relationships. Venus square Saturn at 9:48 AM PST could leave you feeling paranoid. Re-evaluate your feelings and see if they’re justified. The Moon enters the seductive yet secretive sign of Scorpio at 11:09 AM PST which will amplify the emphasis on the sensual side of life but also insecurities. The number of the day is 1, reminding us that with Saturn in retrograde, we are given the opportunity to reset our karma. Mantra: Once we accept growth, it ceases to be painful. 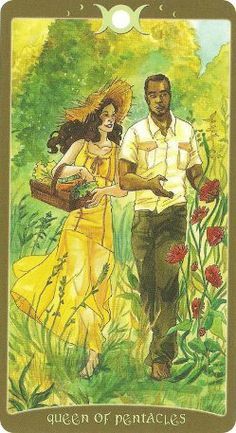 The 4 of Wands is a card of happiness and harmony in the home. Sun trine Mars at 3:33 AM PST. It’s a great day to figure out what motivates you and set goals. Exercise will help you get the wheels in your head turning. Venus sextile Pluto at 4:10 AM PST will bring feelings of unity to those searching for a place to belong. Sexual encounters will be deep and meaningful and strong emotions will bring intensity to relationships. Moon trine Neptune at 8:26 AM PST may find you daydreaming. Beware of self-delusions. Moon trine Jupiter sat 7:31 PM PST will bring a happy, jolly feeling to your evening. Moon sextile Pluto at 10:20 PM PST will give you the courage to do what you have to do. The Moon is in Scorpio so love deeply and curb your temper. The number of the day is 2, a number that stress balance in all things. Mantra: I give thanks for what I have. 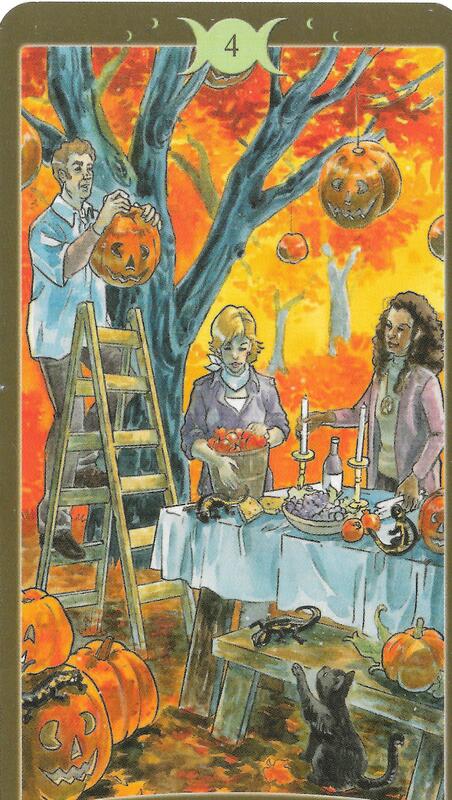 Magdalena Tarot does not claim the rights to any of the Tarot card images used here. 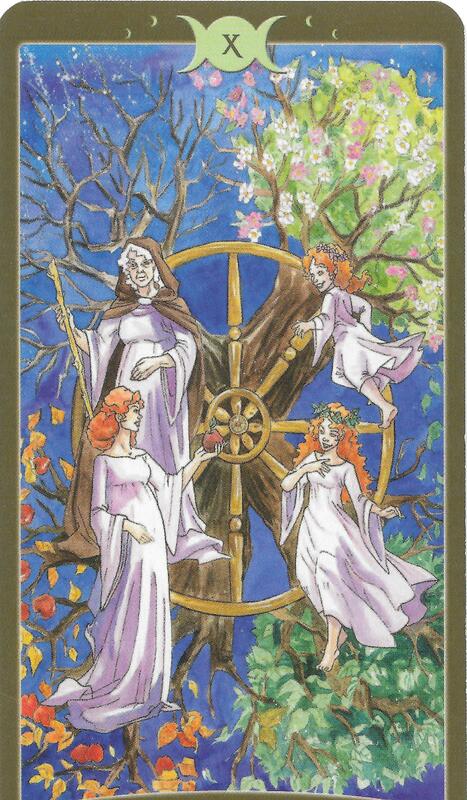 All images are from The Book of Shadows Tarot II. This entry was posted in Astrology, dreams, mysticism, numerology, occult, self help, spirituality, Tarot, witchy, Writing and tagged astrology, divination, mantra, motivational, numerology, occult, pagan, self empowerment, self help, spiritual, tarot, wiccan, witchy. Bookmark the permalink.